For the snatches: Choose your own weight to perform snatches in any style. Muscle, power, split or squat snatches are permitted. Failed attempts may not be repeated. Once the barbell has been lifted off the ground, it will be considered as an attempt. Elbows must be fully locked out overhead and the barbell must in line with shoulder, hips and knees. 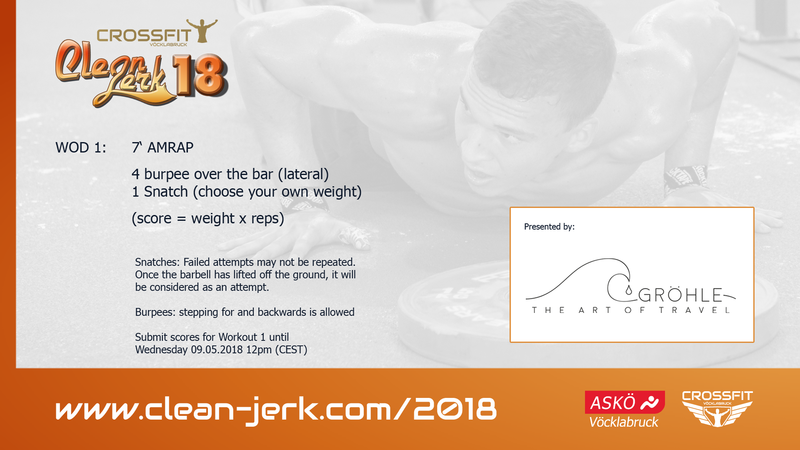 Only one barbell is allowed and the weight can be not changed during the workout. For the burpees: Jumping over the bar with both feeds at the same time. Stepping for and backwards is allowed. Chest must touch the ground.